The PHH45D model has been discontinued. Please see the PHH103B as a possible alternative or contact our Flow Engineering department. The PHH-45D pH meter is a cost-effective unit with a taut band meter movement in a sturdy solvent-and-acid- resistant housing. 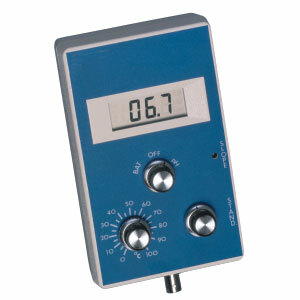 It is a full function solid state instrument capable of measuring pH from 0 to 14 with the aid of offset ranging. The unit features manual temperature compensation from 0 to 100°C (32 to 212°F)and dual point calibration. Attractive and durable, the meter comes packaged in a kit with a gel-filled combination pH electrode, three buffers (pH 4, 7, 10), battery, and a foam-lined carrying case. This inexpensive but reliable pH meter is simple to use and is perfect for use in the field, laboratory, or plant. 참고: Each unit is supplied complete with meter, combination electrode, 4, 7, 10 buffer solutions, carrying case, battery and complete operator’s manual.